A tourist card “Moscow Pass” has been recently introduced in Moscow. The owners of this card receive discounts at restaurants and museums and can book tours at lower prices. 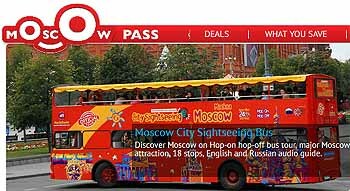 Currently the owners of Moscow Pass can visit the Museum of Russian Icons, St. Basil’s Cathedral, the Museum of the War of 1812, the Museum of Contemporary History of Russia, the Moscow House of Photography, the Museum of History and the Museum of Torture at discounted prices. Moreover they can take part in adventure trips and bus tours of the city, visit master-class of traditional Russian cuisine in the restaurant “White Sun of the Desert”, “Uzbekistan” and other venues.